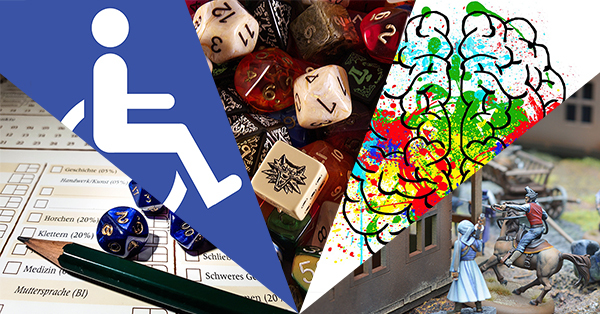 This series aims to identify ableism in the core content of tabletop role-playing games, including game mechanics and central setting elements. There will be brief discussion on the reasons these game elements are a problem. However the focus will be on identifying tools and options for ways that participants can alter these games to reduce or remove this ableism. I want to be clear that this isn’t about proposing the one correct way to address these problems. Both experiences of disability and game play styles will vary from person to person. This is about people finding options for addressing ableism that work for them. Please note that all of the remaining unpublished articles will be expansions of the mini-articles that are currently up in the “Challenges with Game Systems” and “Disabled Player Characters” sections of my “Making RPG Podcasts Accessible” resource document. Sanity Systems. The concept of insanity is a stigmatizing historic concept that has been largely replaced by the more accurate concepts of mental illness and neurodivergence. Tying a core game mechanic to the concept of “insanity,” and its opposite, “sanity,” gives this stigmatizing concept power that reinforces harmful stereotypes. This article focuses on the many options for addressing this problem. Ableist Monsters. Traits associated with specific disabilities are regularly used for monstrous and evil creatures. Not only does this reinforce negative ideas about disability, this also results in harassment and mistreatment of people with these traits. This article identifies disabled traits that are commonly part of stigmatizing depictions of monsters and presents a range of options for replacement traits. Game Mechanics that Treat Disability as a Limitation. Many of the game mechanics that exist for disabled characters create dynamics that reinforce negative ideas about disability. The most common problems are mechanics that fail to represent important experiences of disability, don’t represent disability accurately, create an incentive for players to engage in stigmatizing play, push players into portraying disabilities that they don’t know anything about, and use derogatory language for disability. This article explains where these game mechanics go wrong and discusses different ways to represent disability respectfully. Creating a Diverse Cast of Characters. Trying to think about every type of oppression at once can be overwhelming. What I do instead is write out a list of the cast of characters and go through and assess each type of representation individually. This article is the list of questions I ask myself when I’m doing this assessment process. Preventing Disabled Characters from Being Left Behind with Game Job Descriptions. In progress. Knowing When Characters Have Disabilities. In progress. Game Mechanics that Erase Disabilities. In progress. Creating Empowering Accommodations and Assistive Devices. In progress. Game Mechanics that Lack Options for Disabled Characters. In progress. Hi, are you still working on this series? Because I’m a disabled gamer who has a lot to say on the topic of your putative second article, ableist monsters. Thanks for asking! I am still working on this series. At the moment I have several large projects that I’m in the process of finishing up (including a new version of Magic Goes Awry) that are taking up my time and focus. As soon as that is done I will be coming back to this project. I’d love to hear your thoughts on this topic! One of my goals with this series is to include multiple perspectives and approaches to understanding and addressing these problems. The Ableist Monsters article is up now. I’d love to hear more about your thoughts and experiences. I’m working on a game system right now and I want to be sure I address disabilities as well as I can. I’ve certainly had my own challenges but that doesn’t mean i know what other peoples’ experiences have been so this has been very helpful. Thank you. I’m curious about what point number 2 will cover? I’ve been doing a lot of exciting projects, but they have gotten in the way of me finishing the second article. Right now it is in outline form. However, the “Making RPG Podcasts Accessible” reference document (https://writing-alchemy.net/resources/rpg-podcasts/) that I made for my PodCon2 workshop did give me a chance to write a mini version of it. You can check it out in the “Challenges with Game Systems” section. It has it’s own “Ableist Monsters” sub-section.